The Services of Bernice Roberto are Now Available with Maui'd Forever's Wedding and Vow Renewal Packages. Maui'd Forever is one of Hawaii's few full service, all-Hawaiian Islands wedding planner and coordinator. Founded in 2003 by entrepreneur Mark Steffan, the company operates on the Hawaiian Islands of Oahu, Maui, Kauai and the Big Island of Hawaii. They use over 150 different wedding vendors and still find the need to add additional members to their team. They are happy to announce their newest member on the Big Island of Hawaii, Bernice Roberto. 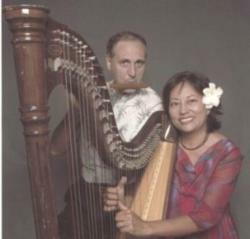 Bernice's company is Hawaii Heavenly Harpist based in Kailua Kona on the Big Island and has been in business since 2000. Bernice is a classically trained harpist that can accommodate any songlist and has been delighting couples in Honolulu, Maui and the Big Island for more than a decade. On the Big Island, Bernice regularly plays at the major resorts, including the Four Seasons, The Orchid at Mauna Lani, The Hilton and the Hapuna Prince. She has played for celebrity weddings and also adds the perfect touch to intimate beach weddings. Bernice is also a performing artist and plays events with members of the Kamuela Philharmonic. Hawaiian music is a sacred and beautiful addition to her repertoire. She is also the lead vocalist and harpist of the Kona Harp Ensemble that features celtic music, original and improvisational work. Zen Moon Rising is a group that features harps, japanese shakuhachi and bells. Solo harp can add the perfect touch to any ceremony. Harp and flute is a traditional combination. Choose from flute, violins, violas and cellos with the harp. Or guitars and ukeleles with the harp to reflect the local flavor. On Bernice's website you will find suggested songlists and music for your listening pleasure and beautiful photos of great weddings. She is a great addition to any destination beach wedding. One can reserve Bernice with any of the Maui'd Forever wedding packages for the Big Island of Hawaii.